Naturebox is a monthly healthy snack subscription box. You get to choose the snacks they send you from a variety of options. I had to try them out because I really need to start eating better. I'm kind of a junk food junkie right now. Price: You can choose to receive three or five snacks per box and you can choose the delivery frequency. For all three snack boxes: $13.95 (either every week, every 2 weeks, or every month). For all five snack boxes: $19.95 (either every week, every 2 weeks, or every month). They are currently offering 50% off all subscriptions! Shipping: Free shipping to the U.S., $4.95 shipping to Canada. They currently ship to all U.S. states, protectorates and territories, Canada, and APO/FPO military addresses. I chose the monthly five snack subscription. The snack bags are a nice size and the snacks lasted me a little while. Everything was tasty! I received a $15 off coupon to Sephora so I had to buy stuff!! I love the variety and quality of the products at Sephora. I haven't shopped at Sephora in a long time!! Meowbox is a monthly subscription box filled with cat treats, cat toys, and other cat related goodies. I love that for every box ordered they send one can of cat food to a shelter cat. I think that's wonderful. Price: $32.95 for the month to month plan, $83.85 paid every three months, or $137.70 paid every six months. Shipping: Shipping is Free! They currently ship to Canada, the U.S., and the United Kingdom. I want to try out some of the pet boxes out there so Meowbox was the first one I tried. Skoshbox is a Japanese snack/candy subscription box. They have two types of subscription boxes, Skoshbox is the smaller box filled with sample sized Japanese treats and Dekabox is the larger box filled with 1 pound of full-sized snacks. Price: They offer several plans for the Skoshbox and the Dekabox. *Skoshbox monthly is $12 per month (renews every month), the three month plan is $35 prepaid (non-renewing plan), the six month plan is $66 prepaid (non-renewing plan), and the yearly plan is $120 prepaid (non-renewing plan). *Dekabox monthly is $24 per month (renews every month), the three month plan is $70 prepaid (non-renewing plan), the six month plan is $132 prepaid (non-renewing plan), and the yearly plan is $240 prepaid (non-renewing plan). If you subscribe to the Dekabox you also have the option of paying an extra $2 for a mystery Japanese accessory item. **They currently only ship to the United States and Canada but they are working on expanding to new territories. Want to see what I got in the December Dekabox? Let's find out! I was happy to see there was a lot of goodies in this box. I ordered the monthly Dekabox and I also paid $2 for a mystery accessory. Price: This box is $39.95 per month and includes full-size items valued at over $100. Want to see what's inside the November Popsugar Must Have box? Let's find out! Want to see what's in the November Allure Beauty Box? Let's find out! This month's box came with 6 lovely products!! 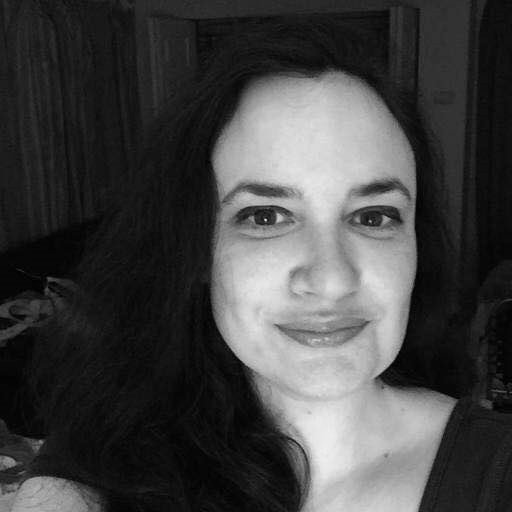 There are 3 different subscription plan options to choose from: The Expert Plan in which you receive a brand new hardcover young adult book, signed book or bookplate signed by the author, 1-2 high quality bookish items, a reading experience with exclusive content, and a personal hand written note to you. This plan is $23 per month. The Book Exclusive Plan which is the same as the Expert Plan without the exclusive items. This plan is $17 per month. The Personalized Plan where you fill out a personalized profile and you will receive a book based on your specific reading preferences. You still get the exclusive items but you will not receive the author content or the reading experience. This plan is $29 per month. I signed up for the Expert Plan. Uppercase currently ships to the U.S., Puerto Rico, and Canada. They also ship to APO addresses. Shipping within the U.S. and Puerto Rico is $6 and shipping to Canada is $19.50. Want to see what's in the November Uppercase? Let's find out! What was inside the Winter 2015 FabFitFun box? Let's find out! What was inside the November 2015 Owlcrate? Let's find out! Julep Maven is a monthly nail polish/beauty box. The cost is $24.99 per month for the month to month plan or $19.99 per month if you prepay for 3 months. You can customize your box each month by choosing 2 nail polishes and a makeup product from the list of monthly selections. You can also skip months at a time if you don't like the choices of nail polish or makeup for a particular month. What was inside my Julep Maven November Box? Let's find out! This month they sent a free nail polish! Want to see what's inside the November 2015 Birchbox? Let's find out! Birchbox boxes are always so pretty. Glossybox is a monthly beauty subscription box filled with five high end beauty samples and products. I received a couple of full sized products in this month's box! Ipsy is a monthly beauty subscription that includes a cool Glam Bag filled with awesome deluxe samples and full-sized beauty products. The cost of this subscription is $10 per month or $110 for an annual subscription. Shipping is free in the United States and $4.95 for Canada. They currently do not ship internationally. You fill out a beauty profile when you sign up so they can better customize your bag. You can change your beauty profile at any time on their website if you're not happy with the products you've been receiving. Want to see what was in my November Ipsy bag? Let's find out! Cool space themed bag this month! Book Outlet has amazing deals on new books daily! They receive overstock from publishers and resell the books for incredibly cheap prices. Some books have remainder marks on the bottom but this doesn't affect the pages of the book. You're basically getting brand new books for very low prices. Awesome!! I recently put in a couple of orders to Book Outlet during the month of October. They had a 15% off sale and I went a little crazy. OK, I went EXTREMELY crazy! I have a book buying problem. I know this. I ended up ordering 30+ books! Most of these books are young adult or middle grade novels because I love books meant for younger readers. I'm definitely not young anymore but I guess reading these books makes me feel young again or something. I don't know. Shipping to the U.S. is $3.99 for the first 2 books and $0.50 cents for every book after that. Shipping to Canada is $3.25 for shipping and $0.80 per item. International shipping rates are based on the order weight and destination. Huge Graphic Novel Haul From Amazon! I still had some gift cards to use from my birthday so I went a little crazy on Amazon. I love graphic novels so I ordered 13 graphic novels! I definitely have a book buying problem. Target releases a beauty box filled with samples and some full size products every couple of months. This is not a subscription box so you just have to try to find out when they're releasing the box and try to purchase it. This box sells out FAST! It usually sells out within a day or two. This is the second box I purchased this month. This box was a little more expensive than the last box but it was still only $10. I was really happy with this box! It was definitely better than the prior Target Beauty box. Want to know what was inside the October Target Beauty Box (#2)? Let's find out! Want to see what's inside the Fall Walmart Beauty Box? Let's find out! Popsugar Must Have is a monthly subscription box filled with the best in fashion, beauty, home, fitness, and food curated by Popsugar founder and editor in chief Lisa Sugar. This box is $39.95 per month and includes full-size items valued at over $100. Shipping is free but they currently only ship to the United States. Want to see what's inside the October Popsugar Must Have box? Let's find out! Want to see what's in the October Uppercase bag? Let's find out! FabFitFun is a subscription box filled with fab items sent out every 3 months. The box includes full size premium beauty products, fitness products, accessories, and more. The cost is $49.99 every 3 months. Every box has over a $200 value and shipping is free in the US. Shipping to Canada is $8. What was inside the Fall 2015 FabFitFun box? Let's find out! Owlcrate is a monthly young adult book subscription box. Every month you'll receive a box filled with a recently released young adult book and several book themed goodies. Every month there is a different themed box. The cost of this subscription is $29.99 a month plus shipping. Shipping to the USA is $6.99, shipping to Canada is $10.59, and international shipping is $19.99. 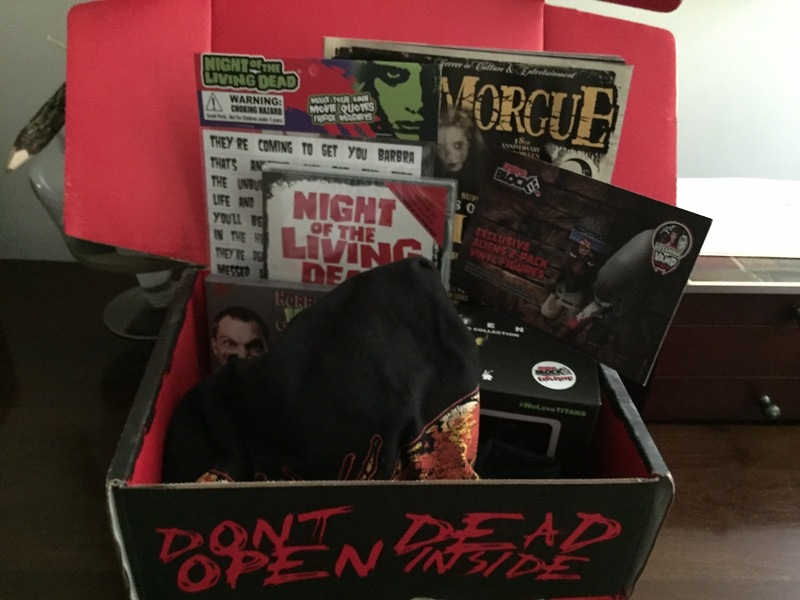 What was inside the October 2015 Owlcrate? Let's find out! Allure Beauty Box is a monthly beauty subscription box filled with at least five deluxe size product samples selected by Allure editors. Every box comes with an Allure mini magazine that describes every product featured in the box. The cost of this box is $15 per month. Want to see what's in the October Allure Beauty Box? Let's find out! I was happy to see some full-size products in this month's box! Julep Maven is a monthly nail polish/beauty box. The cost is $24.99 per month. You can customize your box each month by choosing 2 nail polishes and a makeup product from the list of monthly selections. You can also skip months at a time if you don't like the choices of nail polish or makeup for a particular month. What was inside the Julep Maven Welcome Box? Let's find out! Birchbox is a monthly beauty subscription box filled with five awesome beauty samples. You can fill out a beauty profile so they can customize the samples they put in your box. 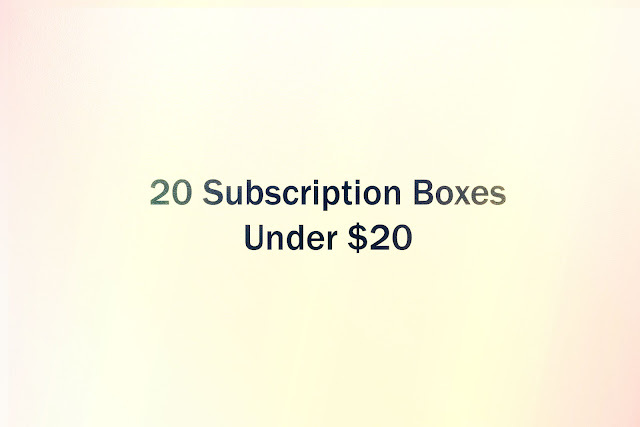 This subscription is $10 per month. Want to see what's inside the October 2015 Birchbox? Let's find out! I had to do it. I couldn't help myself. I had to order this box. Book Riot released this awesome Horror Box filled with 4 spooky books and 3 bookish items. This is a one time box that costs $100. This box is still available (as of today). It is a lot of money but I love horror and I love books so I impulsively purchased this box. 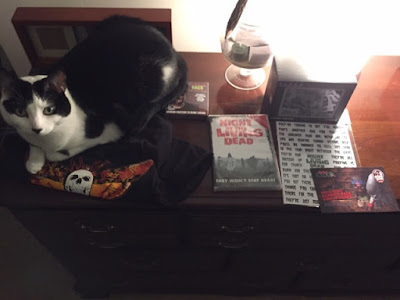 Want to see what's inside the Book Riot Horror Box? Let's find out! Ipsy is a monthly beauty subscription that includes a cool makeup bag filled with awesome beauty samples. The cost of this subscription is $10 per month. You can fill out a beauty profile when you sign up so they can better customize your bag. Want to see what's in the October Ipsy bag? Let's find out! I will be reviewing more boxes soon! I recently received a Julep Maven Welcome Box (nail polish and makeup subscription), a Birchbox (beauty subscription), and an Allure Beauty Box (beauty subscription). I also have more subs on the way! How will I afford all these subs?? I just need to get five more jobs and then I'll be fine. What did I get from Amazon this time? Let's find out! I ordered a variety of things this time. I got a couple comics/graphic novels, a teeth whitening kit, a small pet vacuum, a bed skirt (not shown in box above), and a wet/dry shaver. Target releases a beauty box filled with samples and some full size products every couple of months. You only pay $5.00 for shipping to the U.S. This is not a subscription box so you just have to try to find out when they're releasing the box and try to purchase it. This box sells out FAST! It usually sells out within a day or two. I just got the October box a couple of days ago and I wasn't that impressed by the contents. Want to know what was inside the October Target Beauty Box? Let's find out! This box didn't really impress me. There was one full size product and a bunch of samples. It was L'Oreal themed and I love L'Oreal but I just didn't care for this box. I received this free Welcome Block for signing up for Horror Block. Want to know what's inside? Let's find out! 30 Days of Candy is a relatively new subscription box filled with all different varieties of candy goodness. I had to try this one out because I LOVE candy. Yum! Each monthly box revolves around a theme and this month's theme is 'Around The World In 30 Sweets'. There are 30 different bags of candy, all from different countries. Cool! 30 Days of Candy is $29.95 plus $5.95 for shipping in the U.S.
What's inside this month's box? Let's find out! Horror Block is a monthly subscription box filled with horror goodies. The subscription is $19.99 plus shipping. Shipping to the U.S. is $9.50 so the whole box costs around $29.49 per month. Boxes ship on or around the 25th of each month. They also have other varieties of monthly boxes: Nerd Block Classic, Nerd Block Jr. Girls, Nerd Block Jr. Boys, Comic Block, Arcade Block, and the brand new Sci-Fi Block. All boxes vary in price. I've always loved Amazon.com because they usually have reasonable pricing, fast shipping, and great customer service. They also have a wide selection of products! I will be posting subscription box reviews on here but I'll also be posting all the cool items I purchased on Amazon. Today I received an order from Amazon for 2 books. 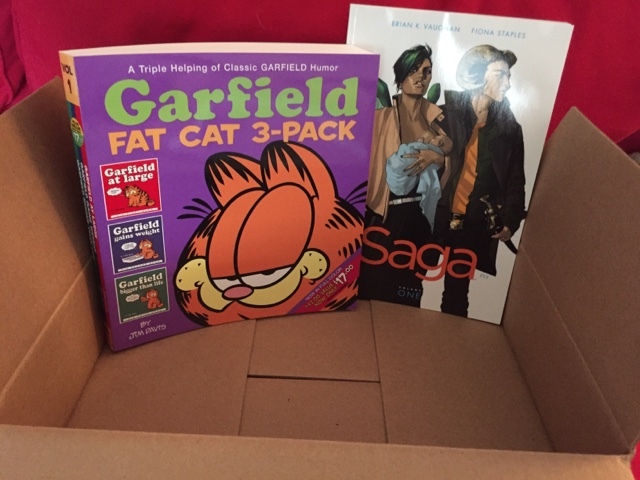 I purchased the 'Garfield-Fat Cat 3 Pack (3 Garfield comic books in one) and 'Saga-Volume One', a cool looking comic that I heard was really good. I love comics and I love Garfield so this should be entertaining. Hi and welcome to my new blog 'Sub Box Diva.' I decided to start a blog because I've recently become obsessed with subscription boxes and I wanted to share my reviews of my boxes with you. Hopefully my reviews will help you to decide if you want to subscribe to any of these boxes. I've only just started subscribing to some boxes and I'm already subscribed to NINE boxes. I need help. I know this. I just can't stop at the moment. I am addicted to subscription boxes! It's like Christmas every month. I love not knowing what's in a box and the anticipation of finding out what goodies are inside. It makes me happy. I really can't afford all these subscriptions but at least I'm happy, right Right?! I've only received one box so far and I LOVE it. I'm a big horror fan so I subscribed to 'Horror Block.' This is a Canadian subscription that costs $19.99 plus shipping. Shipping to the U.S. is $9.50. This is the first box I will be reviewing in the next couple of days. It's a box filled with horror themed goodies. The perfect box to subscribe to near Halloween. I think this box will be a keeper because I received some awesome stuff! I also received a 'Welcome Block' just for signing up and that also contained really cool goodies. I will post a review of that one, too. I'm excited to start reviewing all my subscription boxes with you. Yay! My cat Buckley loves subscription boxes, too!